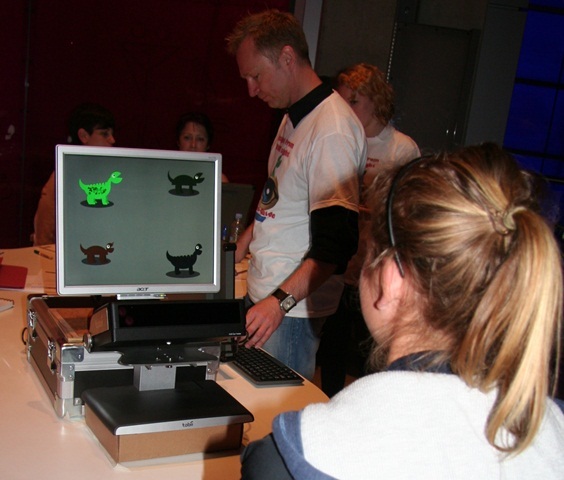 Dr Tim Holmes (standing, centre) testing a participant at the Science Museum. The eye-tracking hardware is the black box just underneath the monitor. In this post I’m very pleased to be able to write about the work of a good friend and colleague of mine, Dr Tim Holmes, of Royal Holloway University. Tim’s work is on eye-movement tracking and he’s recently finished collecting the data on what may be the world’s largest eye-tracking experiment, which also involved evolution, and dinosaurs. More on that below, but first – what’s eye-movement tracking? Two types of modern eye-movement tracking systems - Infra-red cameras built into the frame of a standard monitor (left), and a lightweight wireless system that can be worn in natural environments. Both systems manufactured by Tobii Technology. 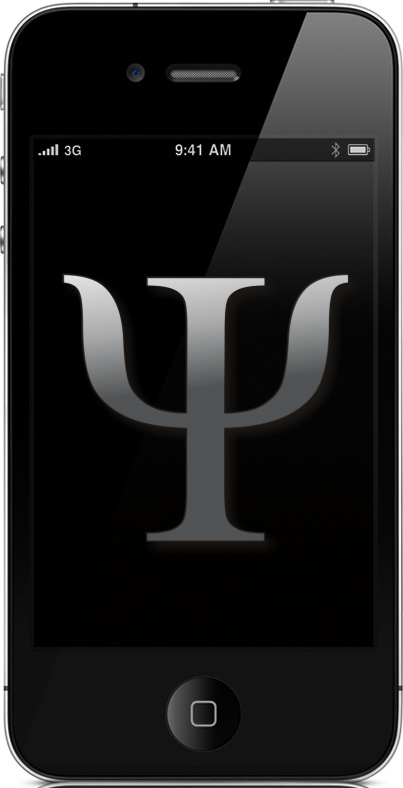 Why is this interesting for psychologists though? The eye (or more accurately, the retina) is part of the central nervous system, and in fact is the only part of the brain that you can see from outside the body. Studying the eyes is therefore in a very real sense studying the brain. Eye-tracking has been used for a whole variety of applications. A lot of early work was focused on reading, and showed that the eyes don’t move smoothly over words – there are distinct pattern of fixation and saccades (the ‘moving’ part of eye-movements) which are associated with reading, and this pattern differs in some interesting ways in people with reading problems like dyslexia. Eye movements have also been shown to be different in a variety of other disorders, like schizophrenia and autism. Like most things involving the brain, if you dig deep enough, eye-movements are incredibly complex and can reveal a whole range of functions and effects. One of the effects that has been demonstrated is that (put very simply) the more we like something, or the more we find it engaging, the more time we tend to spend looking at it. For instance, even newborn babies will spend more time looking at pictures of faces, than at pictures of household objects. Faces are important stimuli for babies, and we appear to be hard-wired to pay close attention to them. This preferential-looking effect can be exploited in various ways in order to gauge participants’ reactions to different stimuli. A market research company might use it to evaluate reactions to different products, advertisements or packaging. The benefit is that you don’t have to ask your participants anything – you just tell them to look at the pictures on the screen. The data you get is (perhaps) more reliable as it doesn’t depend on verbal reports from the participants (who might lie, or express themselves poorly for other reasons). This brings me directly to the work that my colleague Tim’s been doing recently. Tim had the bright idea of extending this technique and making it interactive, so that what’s displayed on the screen changes throughout the experiment, and the changes are based on what the participants have been doing in the earlier trials. The way he managed this was to use an evolutionary algorithm; 16 pictures are presented (four at a time) on each trial (or evolutionary ‘generation’) and the data about which ones the participants look at most is recorded. This data then feeds back into the program, the least looked-at pictures ‘die’, and the other pictures ‘survive’ to pass their characteristics to the next trial/generation. By also introducing variations (‘mutations’) into aspects of the pictures like shape, colour, or size, eventually an optimised stimulus is reached, which is most engaging for that particular subject. Evolutionary algorithms like this are used a lot in computing for various purposes, and the degree to which they model actual biological evolution varies, but this is the first time that such an approach has been combined with eye-tracking, and it’s a very, very cool technique. The participant doesn’t even need any instructions – all they’re told is to sit still and look at the screen, and purely by the pattern of their eye-movements an optimal stimulus for that person can be ‘evolved’ in real time. One frame from the evolving dinosaurs experiment which ran at the Science Museum recently. After getting this technique working properly Tim was asked by the London Science Museum to be part of the “Who Am I?” exhibit that was recently running. 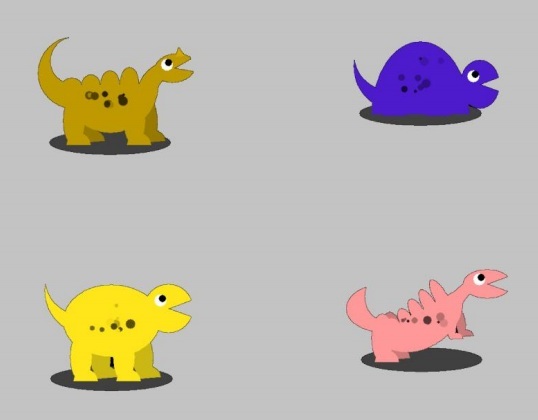 Tim made a version of his experiment that involved cartoon dinosaurs, and visitors to the museum were able to take part in the experiment and ‘evolve’ their own optimal dinosaur in about 5 minutes. Over the 11 weeks that the exhibit was in place Tim and his team were able to test 1400 people (aged from 3 to 76, and from 45 countries!) , which certainly means it’s one of the biggest eye-movement experiments ever conducted, and maybe even the biggest ever. A lot more information about the experiment and some really good explanatory videos can be found on the project’s website. Tim tells me he’s currently analyzing the massive amount of data that was acquired in the project, and I’ll definitely post an update here when he’s finished and has some results to share. If you’re desperate to try the task yourself, it will be running again as part of Royal Holloway University’s Science Open Day in February 2012. Tim’s next projects are working with colleagues at the University of Liverpool on a study of preference for symmetry, and working with a charity called SpecialEffect to adapt his eye-gaze-driven evolutionary algorithm into a computer interface and learning tool for children with disabilities. This is, needless to say, totally awesome, and furthermore shows that even the most technical and data-driven areas of psychology research (like eye-movements) really can have solid, real world applications, given the right context and most importantly, the right technology. *Also, eye-tracking/head-tracking at the lower resolution end is becoming much cheaper and more accessible and can now be done using simple webcams. The precision of such systems is much less (about 5 degrees of visual angle) than specialised hardware, but still good enough for a whole range of applications. You can expect to see this technology coming to a PC (and even an iPad) near you very soon! Baroness Greenfield – is a little scientific restraint too much to ask? I’ve so far managed to resist putting any outright opinion pieces up on this blog, but one particular news story caught my eye this morning that I just couldn’t resist commenting on, partly because it’s somewhat relevant to the topic of this blog (it contains computers, and psychology, so, y’know, that’ll do) but mostly because it made me want to repeatedly drive my head into the nearest hard surface while screaming things that even a Dutch sailor would find a bit offensive and inappropriate. The story in question is this one, appearing in the Telegraph today, and written by their science editor, Nick Collins. It contains several quotes from Prof. Baroness Susan Greenfield relating to video games and the effect they have on children. The story has been quickly picked up by the two most offensive rags in the UK, The Sun and The Daily Fail, and at the time of writing is currently also attracting a fair amount of attention on Twitter. Before we get to the story itself, some background. Baroness Greenfield is a well-known scientist in the UK; a professor of synaptic pharmacology at the University of Oxford, a peer in the House of Lords and an ex-president of the Royal Institution (she was made redundant from that post in 2010). She’s without doubt a very capable scientist with an impressive list of top-ranked publications in neuroscience. However, in August, she made some strange comments in a New Scientist interview, appearing to link internet use with various kinds of dysfunctions, including autism. A response followed from Dorothy Bishop who published an open-letter on her blog, imploring Baroness Greenfield to essentially be a little more responsible in what she says to the media, and to stick to her areas of expertise. Greenfield’s response was to say “I point to the increase in autism and I point to internet use. That’s all.”. This comment was widely derided as reflecting a basic error in reasoning that every first-year psychology undergraduate should know about, and gave rise to the often-hilarious twitter hash-tag #greenfieldisms. Obligatory XKCD cartoon about correlation and causation. This seems to me to be a reasonable, if debatable point. Internet addiction is becoming a reasonably well-documented issue, and there is at least some evidence for the involvement of striatal dopamine systems in its phenomenology, so, OK.
“can be temporarily disabled by activities with a strong sensory content — ‘blowing the mind’. Now, I had my mind blown yesterday by the trailer for the new Avengers movie which just came out. Does that mean I’m a massive geek? Yes it does. Does it mean that some of the connections in my brain were temporarily disabled? Probably not. There’s little doubt that sensory input can certainly change the strength of synaptic connections through the well-known phenomenon of Long-Term Potentiation and it’s thought by many that LTP might be the process through which memories are stored and information is processed in the brain. Temporarily disabled, though? Very Unlikely. Moving on to the last quote, Baroness Greenfield seems to be saying here that screen technologies cause dementia. Dementia. In children. Let’s just think about that for a second, shall we? Dementia and neuronal degeneration are generally only seen in older adults and the word ‘dementia’ normally implies a profound and global loss of cognitive function. To use it in this context seems mightily excessive. Also, let’s not forget that Baroness Greenfield herself has previously publicly endorsed the MindFit cognitive training programs – essentially computer games – despite there being little evidence that such “brain-training” tools actually achieve anything useful. My point in recounting all this is that as a public figure, and particularly after the backlash which greeted her previous comments on autism, Baroness Greenfield really should know better than to use such emotive language when talking about issues like this. Of course parents are worried that their children spend too much time fiddling with their XBox and not enough time outside climbing trees, and there’s almost certainly a sensible and important evidence-based debate to be had about the issue, but to fire off unsubstantiated and emotive comments about it just leads to screaming Sun headlines like “Computer games ‘are giving kids dementia'”. This helps no-one, least of all the kids that might conceivably be at risk. What’s more, as a scientist (and no matter what you may think about her public persona, her scientific credentials are formidable) Baroness Greenfield should know better than to make unsubstantiated claims. One of the big mistakes that science undergraduates always make when writing up research projects is to make interpretations in their discussion which go beyond the data they are presenting. PhD students get this tendency relentlessly beaten out of them by their supervisors and learn to hedge their conclusions with the right amount of caveats and conservatism, and reviewers of papers (in my experience) will also respond mercilessly to any small instance of speculative interpretation. I find it most peculiar that after a long and distinguished career in science Baroness Greenfield feels the need to make such comments. Is she doing it deliberately, perhaps in some misguided attempt to spark a debate? Does she just enjoy the publicity? I have no idea, but in order to avoid further damage to her reputation, and to the reputation of UK science as a whole, for which she is a representative, she should certainly consider her words more carefully in future. Note: I’m a neuroscientist, so I’m not totally unqualified to comment on this, but I’ll happily admit I’m no expert on video-games, neuronal degeneration or dementia, so if anyone wants to post a correction to anything I’ve said here in the comments then please feel free, and I’ll gladly amend the article if necessary. Likewise, the quotes are taken from UK newspaper websites and (as usual with newspapers) no citation to an original source is given. In the interests of fairness and balance I should note that it’s possible that Baroness Greenfield’s quotes have been taken entirely out of context and don’t accurately represent the more general tone of what she said, however my final point still stands – when you’re a public scientist you have to be very, very careful about what you say, because the mass-media absolutely will take quotes out of context and make hysterical headlines out of them. Yet another quickie linky-out post I’m afraid, but at least this time it’s to things that I’ve actually written, which are just hosted elsewhere, so I feel slightly better about it. Firstly, I am honoured and humbled to be a guest blogger, and the first writer with a ‘featured post’ at The Neuron Club. These fabulous gentlemen and ladies are a bunch of brain scientists from the New York area, and their blog is full of great stuff. My post is on an important aspect of fMRI methods which is something that I’ve been wanting to write about for some time, but didn’t feel was right for this blog, so I’m really happy to be able to get it out there. If you’re interested in fMRI at all, you should go and check it out. The other thing I wanted to point you to was a review of the movie ‘Limitless’ which I’ve written for the site Scientific Kitty. This site solicited reviews of movies, books etc. by scientists, from a scientific perspective, and since I’m a massive movie-geek, I thought I’d give it a go. There’s only a few other reviews up on the site at the moment, but it seems to be expanding rapidly, so definitely one to watch.